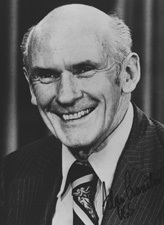 CRANSTON, Alan, a Senator from California; born in Palo Alto, Santa Clara County, Calif., June 19, 1914; attended the public schools in Los Altos, Calif., Pomona College, and the University of Mexico; graduated, Stanford University 1936; International News Service, covering England, Germany, Italy, and Ethiopia 1937-1938; chief, foreign language division, Office of War Information 1940-1944; enlisted in the United States Army in 1944 and served until the conclusion of the Second World War; national president, United World Federalists 1949-1952; elected State comptroller of California in 1958, and reelected in 1962; business career in land investment and home construction; elected as a Democrat to the United States Senate in 1968 for the term commencing January 3, 1969; reelected in 1974, 1980, and again in 1986 and served from January 3, 1969 to January 3, 1993; was not a candidate for reelection in 1992; reprimanded by the Select Committee on Ethics for improper conduct on November 20, 1991; Democratic whip 1977-1991; chairman, Committee on Veterans Affairs (Ninety-fifth, Ninety-sixth, One Hundredth through One Hundred Second Congresses); unsuccessful candidate for the Democratic nomination for President of the United States in 1984; was a resident of Los Altos, Calif., until his death on December 31, 2000; remains were cremated. Scribner Encyclopedia of American Lives; Fowle, Eleanor. Cranston, the Senator from California. 1980. New ed. Los Angeles: Jeremy P. Tarcher, 1984; U.S. Congress. Senate. Tributes to the Honorable Alan Cranston. 102d Cong., 2d sess., 1992. Washington: Government Printing Office, 1992.